Parking is located at the back of the building. We start with free range, all natural amish chicken. It’s brined, dredged, then dropped into custom-built fryers. 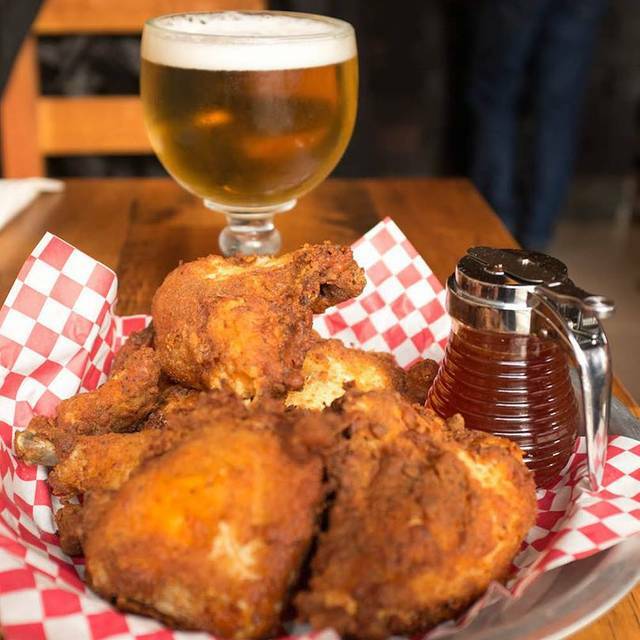 Its got a little kick and is served with our house made hot honey. Great food and nice environment!! The staff was as great as the food. I took an elderly relative and they were very attentive and accommodating even though it meant changing table reservations around at the last minute. They were fast and efficient and never made us feel as if we were causing a problem. As someone who has worked in the restaurant business, I was very impressed. Food was amazing... chicken delish, sweet potatoes, Mac and cheese, mashed potatoes and the kale dip all great... greens a little too vinegary... will go back!! Great dinner. Best chicken I’ve had and we got very personal service from Amy the manager. Highly recommended! 45 minute wait to be seated when we made a reservation and then waited another 45 minutes for our food. We were provided a free appetizer which helped ease the sting of waiting so long. The food was good. Fantastic food, and great atmosphere. We had a weird table in the corner behind the bar and I think our server forgot about us at times for water refills (needed more than expected with the spicy honey) but been here a few times and it never disappoints. Fantastic spot. I normally don't eat meat but my husband highly recommended this place. Because he ate at one with our daughter and friends in Cincinnati and loved it! So I decided to take his mom and our son to eat there. We didn't have to wait at all to be seated which is good and bad. Because my hubby said the one in Cincinnati has at least an hour wait. Long story short the server had way too many tables for her to handle so she wasn't around much. After taking our order she disappeared. We ordered a lot of food for 3 people. The spoonbread, kale salad, French fries, chicken sandwich, shrimp to boy, and a whole chicken. The chicken was very greasy as if it has been cooked and sat in a warmer like KFC buffet. Just drowning in it's on grease. Honestly if it wasn't for my mother in law and son. I probably would have left. With that said I would have complained too if I did not have them with me. We brought the entire chicken home and I had to throw it out because it was so greasy and over cooked. 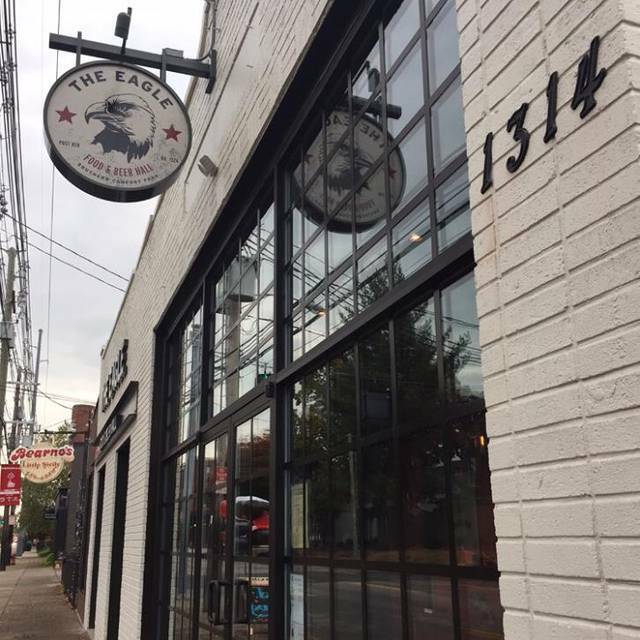 Next level fried chicken, fun atmosphere and good service. 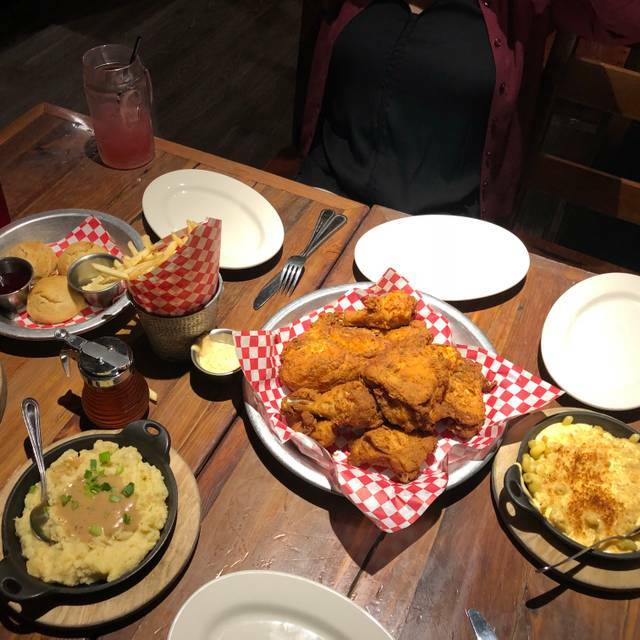 Try the succotash, spoon bread and cheesy mac. Good selection of tap micro brews and hello, bourbon flights. My family and I loved our meal at The Eagle. We have the fried chicken, fried chicken sandwiches and the kale salad. We also had the mac and cheese and fries as sides. All of the food was outstanding. This is not the place to go for low cal fare, but the if you are in the mood for comfort this is the place to go. I also enjoyed the bourbon flight! We will be back on our next visit to Louisville or Cincinnati. 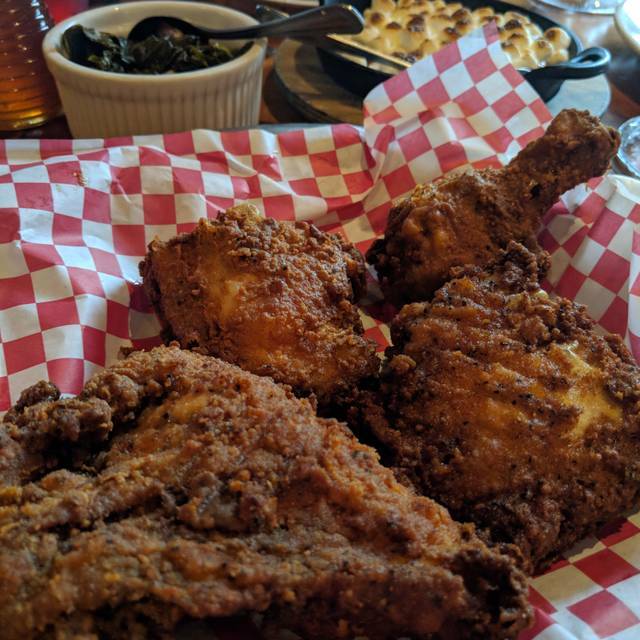 Tasty fried chicken and lots of southern sides... I had a small kale salad which was very good as well. 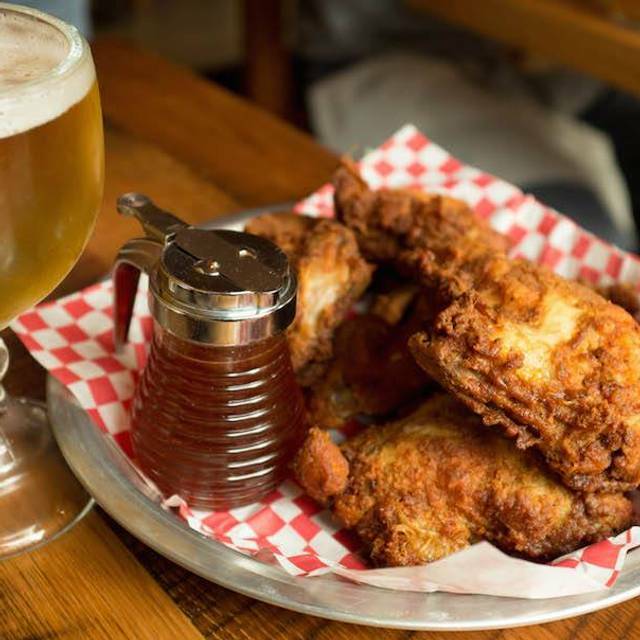 The menu is somewhat limited but they are known for the fried chicken so go for it! On vacation with family. First stop after getting off the road. The ambiance is Lu rly and it’s hit a great feel. However the food is hit and miss. The bacon that everyone raves about literally felt and looked like it was dipped and spread with lard first. The menu is all a la cart and the portions are not very big in terms of sharing ( mac and cheese was very small). The kale salad was good and the pier boy was a decent size and tasted good. The chicken sandwich was mediocre as were the collards. Biscuits also weren’t anything out of this world. Just didn’t live up to the expectations set by the website and the decode and feel. Services was friendly but spotty. Manager gave us free biscuits because our were burner and a new batch took forever to make . So as I said friendly service and it spotty. It’s also in an adorable part of the city so there is that ! I made reservations for two but i needed three seats and the site didn’t recognize my modification. The reservation for three was honored and the manager sent us two complimentary appetizers to compensate for the error. Very classy. The food was excellent too. Food and service was great as always! Great chicken w/the spicy honey...wonderful sides! Mac-N-Cheese was amazing! Collard greens, Spoonbread and HorsradishMashedPotatoes were great, as well. Also recommend the grilled cheese! The food was good but our reservation wasn’t ready, and after 15-20 mins they said we could either wait for a table or sit at the bar. Wasn’t bad but there was no point in our reservation because we had to wait and still never got a table. Even with reservation we waited 35 minutes. Then waited an hour for our food. I doubt I will be back. Chicken was good but didn’t compensate for the other failures. Great size portions for the price! We ordered the kale salad to start, 1/2 chicken, mash potatoes, mac n cheese and biscuits. Everything was delicious! My only complain is the breading on the chicken was a little thick and salty. However, the chicken was cooked perfectly. All of the staff was friendly and efficient. Wonderful. 1st timer. Had the kale/sausage dip. Stir it up to mix the ingredients. You won’t be disappointed! Chicken sandwich was delicious. Our table ordered 3 sides which were shareable. And of course, have a craft beer. We had a large party that was accommodated very well. No complaints from the group, food was amazing (MAC & cheese was a big success). Thanks for making it a great night. Only complaint is wish the service was better. Understand there are sometimes kitchen issues but seemed to be only a service issue, as the food was amazing. Poor service included waiter absence for long periods of time, no drink refills unless party members asked for themselves, no silverware until party members asked for themselves, and small salads that were suppose to come before entrees did not arrive until main course. 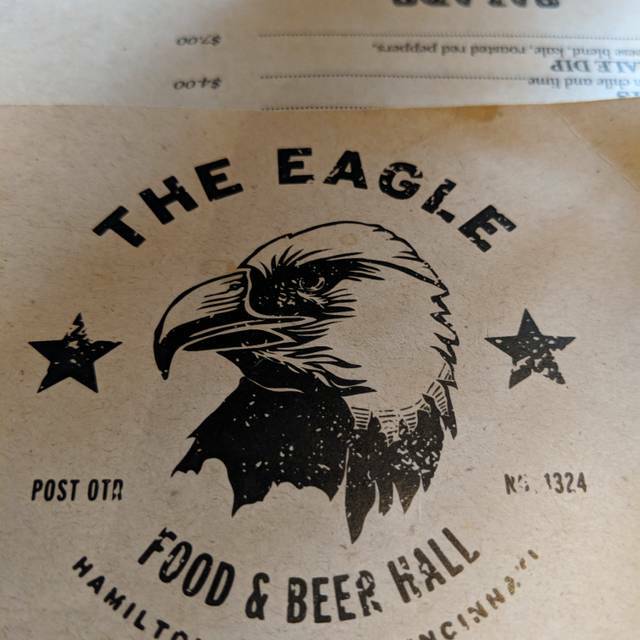 Have been to the Eagle in Cincinnati and have always enjoyed it! The one in Louisville was just the opposite. Food was cold and tasted old. Not going back. Amazing food and yummy drinks! 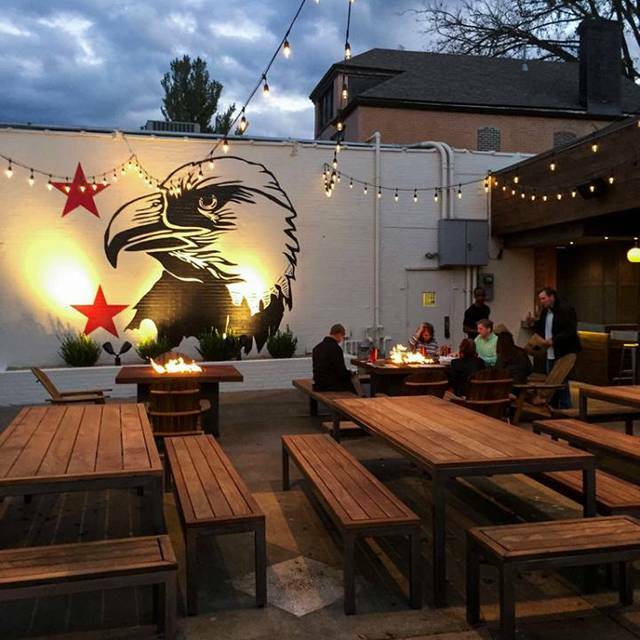 The Eagle is one of our go to date night restaurants, we love it there! The food was excellent. 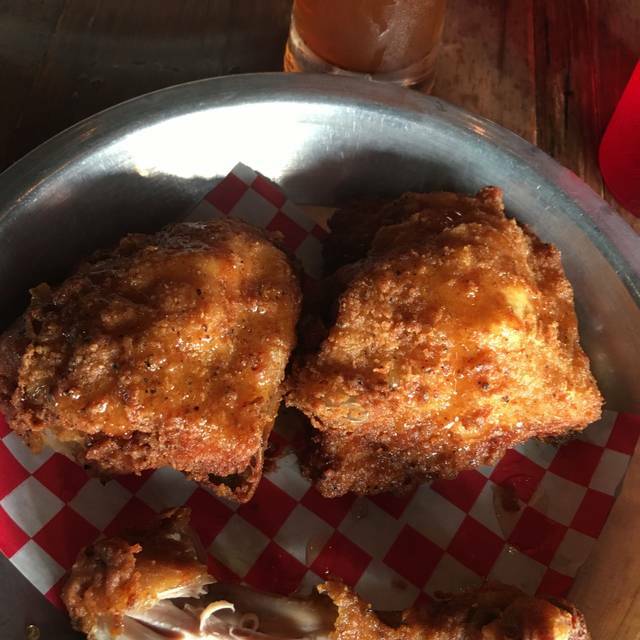 Really good fried chicken. The only reason I did not give it a 5 was because drinks were hard to get. It was the day of the St. Patrick's Day parade, so I am hoping this is what affected the service at the bar. The chicken is amazing! But the sides are as well, even the fries are extraordinary. My favorite appetizer is the fritter. The fried chicken is the best around!! This was dinner with some friends. The menu is limited. I had fried chicken which was too hot. I had burgoo that was below average. The server was very good. We had a bad table in a high traffic area. Delicious chicken and side dishes. Chicken not hot spicy but flavored with seasoning. Mac and cheese was a favorite! Great experience! Delicious food, great service, comfortable atmosphere. Will definitely return! As always, the Eagle hit the mark. I took a group of colleagues to dinner and they barely came up for air after our meal arrived. I have been to the OTR location many times. The Louisville location was bigger, but had just as much character as the OTR location. Made a reservation for 8 and got to sit at a table upstairs that was semi-secluded from the other diners and it was great! Great service and good food! We thought we would do the family meal but decided that choosing our own assortment of sides was better. Would love to come back in warmer weather to sit outside! It was great, food was amazing. Loved it!!! Food was great, service was a little slow for refills. We have been to the Eagle probably 8 to 10 times. Always good service, meal, etc. This time very different. We had a reservation and did not get seated until 30 mins later and probably because my adult son was experiencing low blood sugar levels and almost passed out. We appreciated someone getting him water until we got seated. 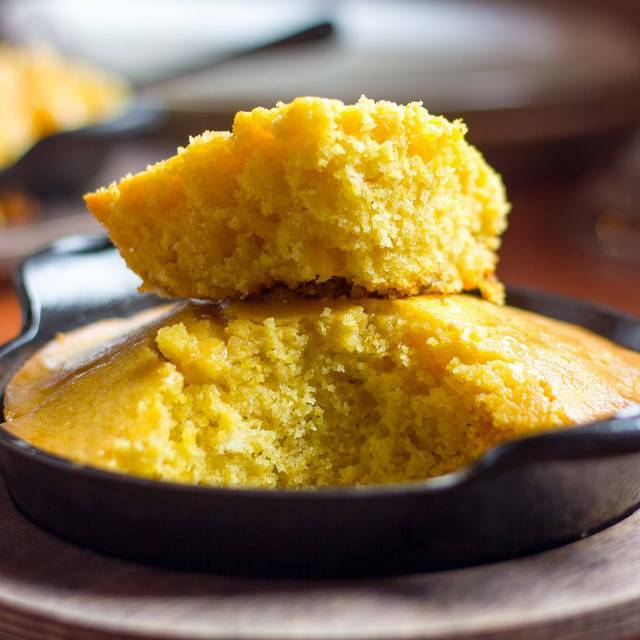 Once seated our cornbread appetizers came very quickly which we appreciated. Once food order was taken, it took a long time. We had 4 orders of mac and cheese and everyone was cold to touch on top and barely warm underneath. Never had that before. Chicken was very good as always. Two had coke refills that had to come in plastic to go cups because no cups were clean. It definitely wasn't the pleasant experience we've always had in the past. It was several things which I feel warranted this review.